Publications released earlier than 2010 can be accessed at the AQD Repository. Contains information on the nursery, and grow-out culture of mangrove red snapper. A brochure on AQD’s main station. Contains information on the hatchery, nursery, and grow-out culture of sea bass. Contains information on Kappaphycus grow-out culture. Contains information on the hatchery and grow-out culture of catfish. 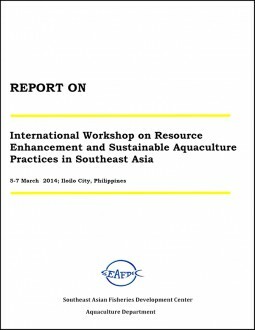 Contains information on the community-based resource enhancement project of SEAFDEC/AQD in Sagay Marine Reserve, Sagay City, Philippines. Contains information on the hatchery and grow-out culture of abalone. A visitor flyer on AQD’s station. Contains information on the hatchery and nursery culture of mangrove crab. Contains information on the microalgae produced by SEAFDEC/AQD. Contains information on the hatchery and grow-out culture of tilapia. Contains information on the hatchery and grow-out culture of giant freshwater prawn. Contains information on the hatchery and grow-out culture of grouper. 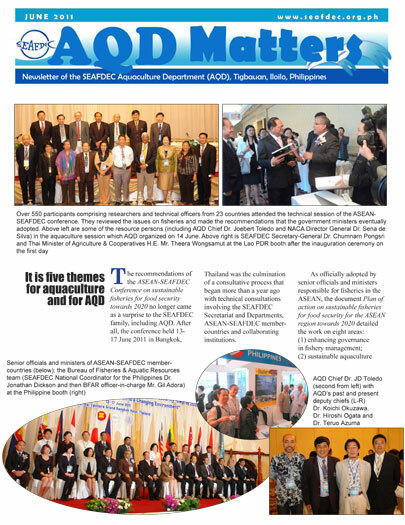 A one-page flyer containing the contact details of SEAFDEC/AQD officials and commodity contact persons. A one-page flyer containing the prices ofAQD hatchery commodities. A flyer containing the laboratory services AQD offers.